You instantly see all types, diameters and prices of VFFOTO magnetic photographic filters! Why are VFFOTO photographic filters with a magnetic frame so popular? Because they can be changed quickly and easily. You just need to put the filter closer to the adapter which is at the end of the lens and it will be fastened immediately. And you can take it off easily as well. 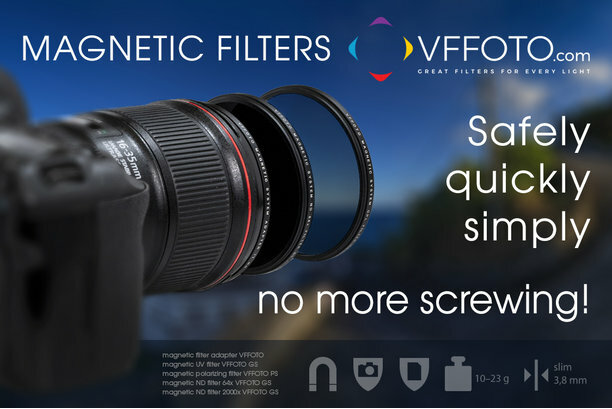 This is a solution for everyone who has a problem with screwing when changing the filters..
What makes the magnetic filters VFFOTO so special? It is their simplicity. Instead of two adapters that you can usually find in case of some similar systems (one is at the end of the lens and the other one on the regular photographic filter), in case of the VFFOTO filter, the photographic filter represents directly the counterpart to the adapter. Or there can be even more photographic filters as it is possible to place them in layers and to attach more photographic filters at the same time (i.e. polarizing filter together with an ND filter). You can also easily use the original lens hood delivered from the producer of the lens together with the attached magnetic filters. New magnetic filters can not be combined with current screwing filters as they represent a completely different system. We will be producing both types of the filters simultaneously so that our customers can always choose either screwing or magnetic filters. We strongly recommend protecting your filter by a reliable lens cap during the time you are not photographing. Therefore we deliver such a lens cap together with the filter. Do you want to enjoy taking photographs with the most simply exchanging of photographic filters? Equip your lens with a VFFOTO magnetic filter!